By Chris Williams: WBO welterweight champion Manny Pacquiao reportedly now wants to fight WBC welterweight champion Floyd Mayweather Jr. according to fighthype.com. Michael Koncz, the adviser to Pacquiao, says Pacquiao told him he wants the Mayweather fight now. This is nice to know but still meaningless until Pacquiao sits down and convinces his promoter Bob Arum that it’s the right move. Arum has already let his feelings known about whom he wants Pacquiao to fight next and it’s not Mayweather. Arum wants Pacquiao to fight Juan Manuel Marquez for a fourth time in early 2012, and then after that Mayweather. However, Pacquiao has other ideas. 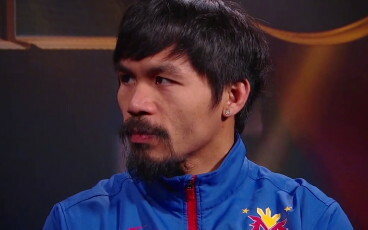 Why Pacquiao now wants the Mayweather fight is debatable. My guess is Pacquiao doesn’t want any more of Marquez after winning a fight that pretty much the entire boxing world thinks he should have lost. By getting back in the ring again with Marquez so soon, Pacquiao could end up not getting the nod this time by the judges. And that would ruin the big money fight against Mayweather. Instead of Pacquiao getting the nice cash payday, it would be Marquez who would be facing Mayweather for a second time. Pacquiao doesn’t need to fight Marquez ever again. Pacquiao and his loyal followers can point to the judges’ decision while ignoring the rest of the world who saw it differently from the three judges. Pacquiao got his win and can move on. Sure, he’s now tainted because of the controversial win, but there is enough boxing fans who want to see him fight Mayweather that it really won’t matter. However, what we saw revealed in the Marquez fight in terms of numerous flaws in Pacquiao’s game will be highlighted even more by Mayweather. It’s going to be an embarrassing night for Pacquiao when he faces Mayweather. Think of Pacquiao like a bald tire trying o drive up an icy hill in the snow. He’s just not equipped to face a guy like Mayweather, and it’s going to be apparent once the fight gets underway. Pacquiao failed the preliminary fight against Marquez, and really should be weeded out rather than moving forward. But let him go ahead and fight Mayweather. It’s going to be Pacquiao’s mistake. Instead of realizing that he doesn’t have the skills needed to fight Mayweather, he’s going to go ahead and take the fight anyway and end up getting whipped. I think Pacquiao needs to follow the advice of his close friend Amir Khan by retiring from the sport, because he doesn’t have it anymore from what I can see. The legs are gone, and without the ability to move like he used to, Pacquiao is going to be like a wounded duck against Mayweather. He got old fast.